Emaar Hospitality Group’s portfolio includes Address Hotels + Resorts, Vida Hotels and Resorts and Rove hotels. 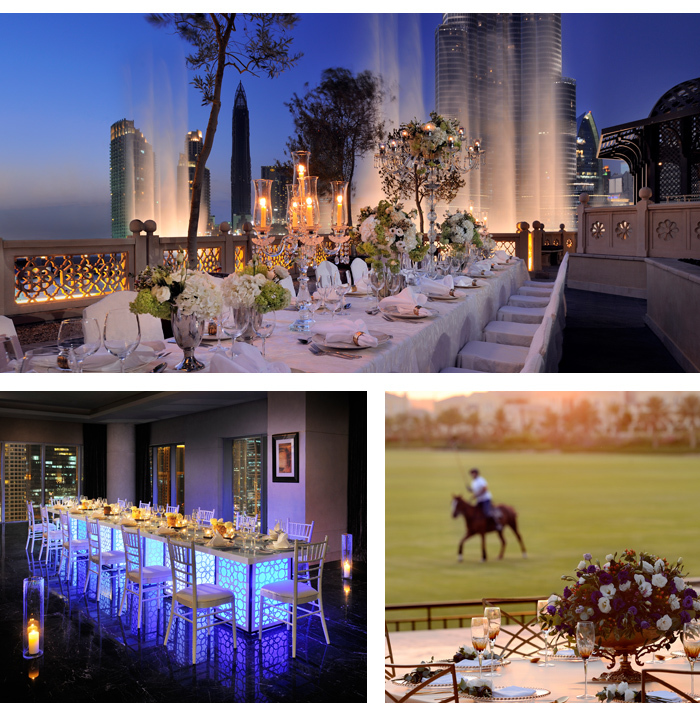 Stunning venues include The Dubai Polo and Equestrian Club and the Arabian Ranches Golf Club. Host your Mehndi, Bridal Shower and Wedding in a selection of perfectly appointed spaces. Each venue offers a myriad of unique options. 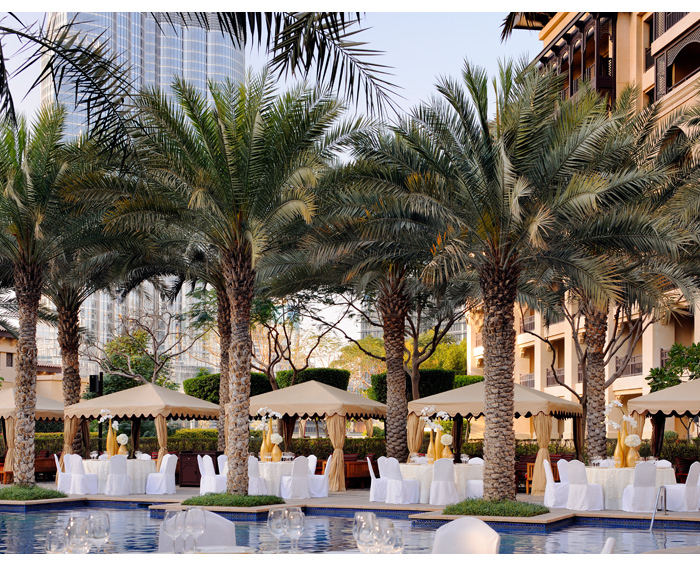 Whether it’s brunch with the in-laws or afternoon tea with your hens, Emaar Hospitality Group has you covered. Chefs can curate menus for an extra special touch. Dubai is less than 7 hours flight from the UK and 3 hours from India and Pakistan, making it easier to invite all! For an unforgettable reception, we love The Viewing Deck at Palace Downtown Dubai (www.TheAddress.com/en/Hotels/The- Palace-Downtown-Dubai), also popular with some of Bollywood’s most famous names. Picture dining against the backdrop of the Burj Khalifa and the Dubai Fountain (top left). It may seem intimate, but the Viewing Deck can welcome an astonishing 200 guests for a reception and up to 120 for dinner. Meanwhile the Palace’s palm-lined Pool Area, with Arabian tents for a touch of desert mystique, is the perfect location for a super-glam celebration, with space for up to 500. Having a particularly BIG wedding? Then consider the Mongomerie; the hotel and vivid green golf course offer a boutique vibe, despite having a very generous guest capacity. The award-winning culinary team is on hand to create mouthwatering menus or help design a feast that reflects your tastes. 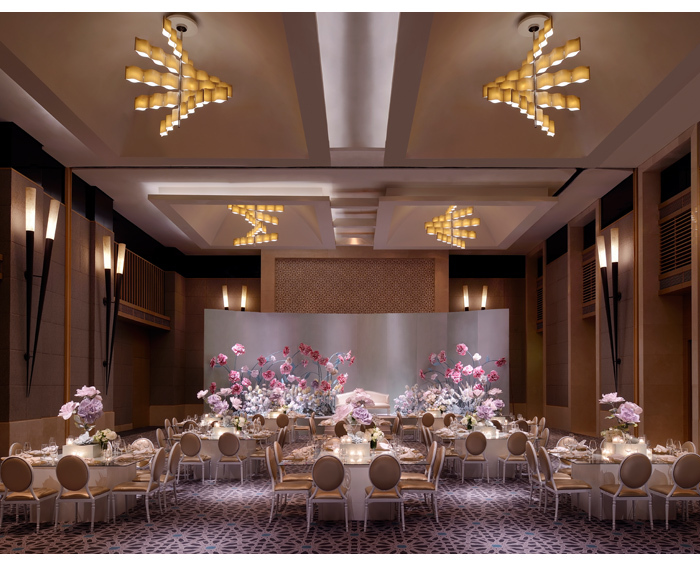 Located beside the world’s biggest mall, this venue is ideal for the fashionista bride. The Diamond Ballroom is simply spectacular, with room for 600 for a reception, 350 for a banquet and 550 for a theatre-style seating. Most popular with Asian couples, the luxury resort sits by the superyachts of the Marina. 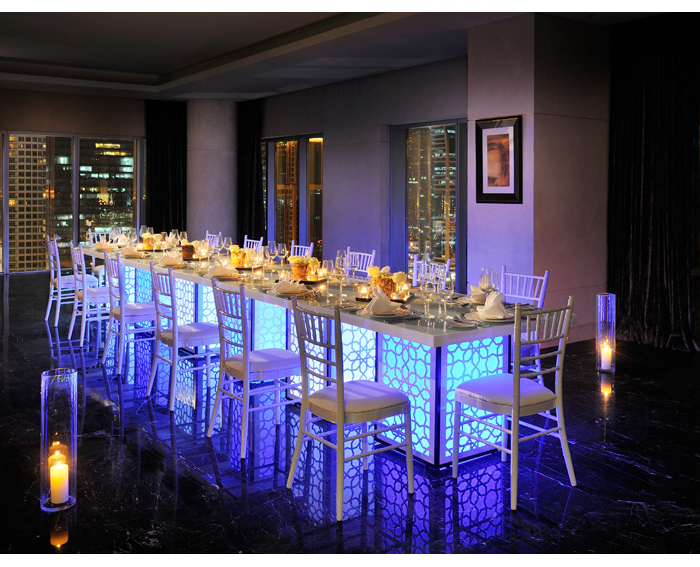 The Constellation Ballroom can accommodate up to 800 seated guests while the outdoor terrace overlooking the Sheikh Zayed Road is perfect for cocktails. 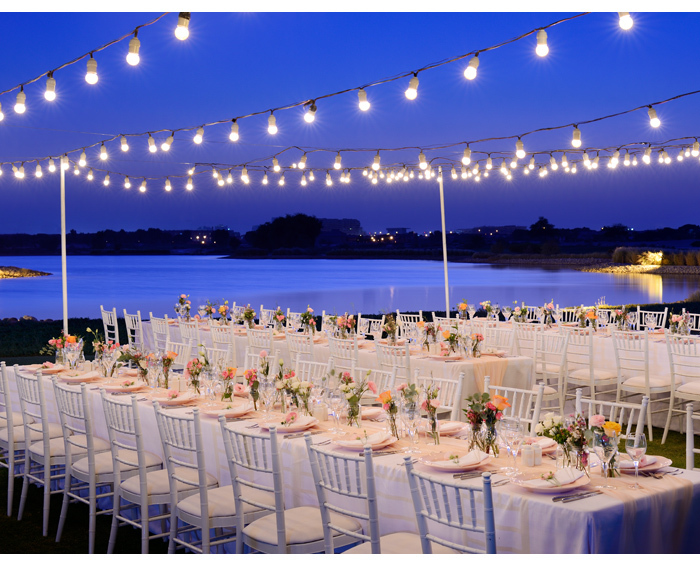 Surrounded by rolling green, and with spectacular views from a Spanish-style clubhouse, the Arabian Ranches Golf Club is where the finest service, delectable cuisine and stunning backdrops unite for the most significant day of your life. Planning the perfect wedding is about far more more than booking a venue - you need a team of suppliers to create the day of your dreams. Emaar Hospitality Group knows this, and has already done the leg- work by sourcing the city’s best artisans, all ready and waiting to make your W-day wishes come true. 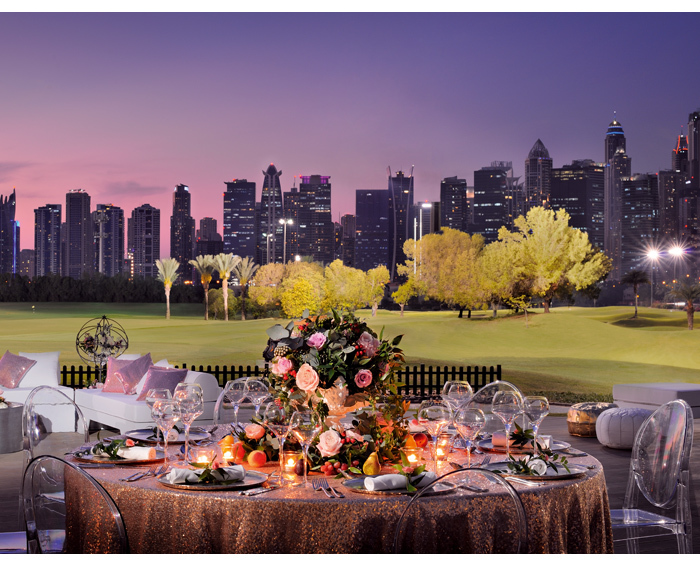 From the best florists to gourmet cake designers and thrilling entertainment Emaar Hospitality Group will help with every detail. Emaar Hospitality Group A portfolio of stunning locations across Dubai to choose from, all within easy reach of the airport.Capacity An incredible 600 guests can celebrate your nuptials in Diamond Ballroom, The Address Dubai Mall.Extra perks How do free spa treatments, sweet culinary delights or a complimentary honeymoon stay sound? Get the best wedding ideas straight to your inbox.